Shelley Cost Hand Signed and Numbered Limited Edition Embellished Canvas Giclee:"Perfect Day (The 18th Hole At Pebble Beach Golf Links)"
Size: 9" x 12" - Multiple Sizes Available. Select from Option Area. Edition: Artist Signed and Numbered Limited Edition to 75 with 10 Artist Proofs. 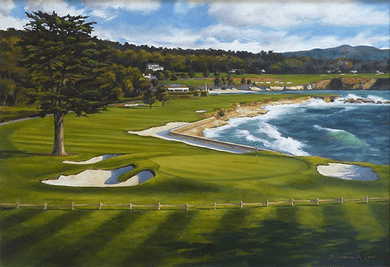 About The Artist: Gallery Direct Art is proud to feature Pebble Beach fine art by acclaimed artist Shelley Cost, a recognized painter of representational landscape scenes of the Monterey Peninsula, including Pebble Beach golf and property. Commissioned to paint Arnold Palmer on the 18th hole and Jack Niclaus on the 17th hole of Pebble Beach, her paintings hang in the Lodge at Pebble Beach. She is known to paint the beauty of the Carmel, California area such as Big Sur, Mission Ranch, The Carmel Mission and Carmel Valley, to name a few. Shelley Cost is also known for the warmth of expression in her children's and animal portraits.